* Do you deal with angry, frustrated or angry customers once a month or more? * Do you get angry, stressed or fed up as a result of your customers? * Have you ever said, after dealing with a customers, "I SHOULD have said..."
* Do you find yourself thinking about a difficult customer AFTER that person is gone, or later in the day? * Would your job be more enjoyable if only the customers weren't so demanding, aggressive, or unpleasant? * Do you provide rent free space in your head to customers who don't treat you as well as you'd like? * Do you want to deal with angry, frustrated, manipulative customers quickly, and professionally? * Control yourself in the face of your own stress and frustration when dealing with a "tough customer"
* Presenting To Resistant, Angry or Resistant GROUPS of clients/customers/audience. 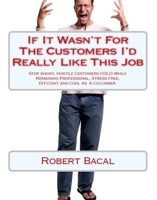 Finally I get this ebook, thanks for all these If It Wasn't For The Customers I'd Really LIke This Job: Stop Angry, Hostile Customers COLD While Remaining Professional, Stress Free, Efficient, and Cool As A Cucumber. I can get now! If It Wasn't For The Customers I'd Really LIke This Job: Stop Angry, Hostile Customers COLD While Remaining Professional, Stress Free, Efficient, and Cool As A Cucumber. was the best books I ever buy. If It Wasn't For The Customers I'd Really LIke This Job: Stop Angry, Hostile Customers COLD While Remaining Professional, Stress Free, Efficient, and Cool As A Cucumber. did exactly what you said it does. I will recommend you to my colleagues. If It Wasn't For The Customers I'd Really LIke This Job: Stop Angry, Hostile Customers COLD While Remaining Professional, Stress Free, Efficient, and Cool As A Cucumber. is the most valuable books we have EVER purchased. I'd be lost without this. I am completely blown away.